Horsham YMCA boss Peter Buckland was delighted that his side picked up an opening day win against a side he has tipped to challenge for the title. 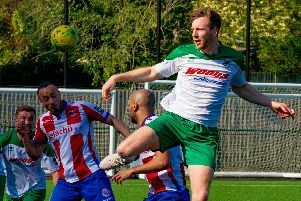 YM opened their Premier Division campaign with a seven-goal thriller as they won 4-3 away against AFC Uckfield Town thanks to a late winner from new signing Alex Barbary. Buckland was pleased that his side got off to winning ways and was glad that his team didn’t suffer the same fate as last year’s opening game. He said: “In our first game last season we went to Pagham and lost 4-0 and we were atrocious. “I’m really pleased with this win because Uckfield are a good, hard working side and I did predict them to be up there and I still do. “There really isn’t going to be many teams that are going to go down there and come away with much. “Every time we got our noses in front they kept coming and coming. “We deserved the win in the end as Tony Garrod hit the bar and someone else hit the post with the header so it could’ve been 5-3 or 6-3. YM fell behind to a 23rd minute goal from Uckfield’s Bailo Camara, before Luke Donaldson equalised nine minutes later. New boy Barbary opened his YM account as he rifled home a header in the 48th minute from a good Garrod cross. Uckfield dug deep and got the equaliser in the 64th minute thanks to a penalty from their player-manager Anthony Storey. Dan Mobsby slotted home a free kick three minutes later to make it 3-2 to YM, only for the hosts to equalise for the third time on the 74th minute through Matt McLean. With four minutes to go Barbary bagged the winner as he gratefully tucked in a rebound from Uckfield keeper Louis Rogers and take the win for YM in a breathless second half. Buckland was pleased with the contribution of the ex-Horley Town man on his debut and compared him to an ex-England international and Spurs striker. He added: “Particular mention to Alex Barbary on his competitive debut playing the full game and scoring two goals. “He reminds me of Teddy Sheringham, he’s got a habit of turning up from nowhere in the right place at the right time and that’s the sign of a good football brain. Horsham YMCA: Jeal, Carden, Evans, Gilbert, Gill, Mobsby, Donaldson, Dugdale, Garrod, Moore, Barbary. Subs: Schaaf, Cave, Harding, Frankland (Unused), Batchelor (Unused).